The event is divided into two days, with the first day showcasing the elevator pitch and expo sections of the competition. After an initial prescreening, forty-five qualifying teams were present in the Henry W. Bloch Executive Hall for Entrepreneurship and Innovation, where one individual from each team delivered a two minute sales presentation to judges. 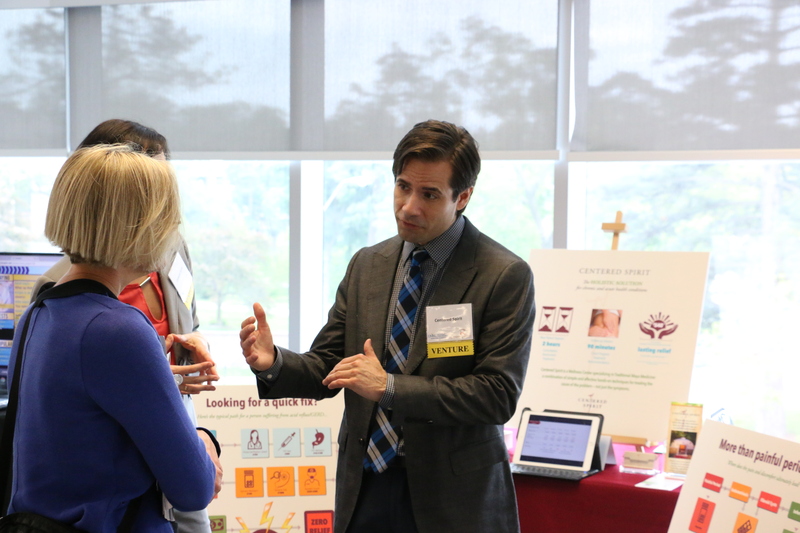 Immediately following was the Regnier Venture Creation Challenge expo, where each team hosted a booth representing their venture and spoke to judges and community members about their business model and upcoming strategies. Following the expo, an esteemed judges panel made up of 18 local entrepreneurs and venture professionals deliberated, narrowing the pool to 16 semifinalist ventures based on the submitted business plan and performance in the elevator pitch and venture expo. Semifinalist presentations will take place from 9:30-11:10 a.m. Friday, May 6, in the Henry W. Bloch Executive Hall for Entrepreneurship and Innovation. Finalists will be announced at 12 p.m., with presentations beginning at 12:15 p.m. The 2016 Regnier Venture Creation Challenge closing ceremony and awards presentation will take place at 2:45 p.m. in the Henry W. Bloch Executive Hall for Entrepreneurship and Innovation, room 218. For more information on the 2016 Venture Creation Challenge, contact Jeff Hornsby at hornsbyj@umkd.edu or 816-235-2320.